Samsung Galaxy S8 cases, eh? Kind of necessary, right? All that beautiful glass and metal, with not a button in sight, exposed to all those potential hard surfaces without protection doesn't even bear thinking about. One slip and, whoops, there goes the screen on your new £600 smartphone. No, you NEED a case for the Samsung Galaxy S8 and here, because we're T3, we've rounded up the best Samsung Galaxy S8 cases for the flagship Android smartphone. We've got Samsung Galaxy S8 cases for every budget too, so even if you've got south of a tenner to spend, you'll still find a case that can protect your sweet new phone. So if you want a top Samsung Galaxy S8 case read on for some great recommendations. This Olixar case is made up of different layers, a TPU core, which absorbs shock, a metallic polycarbonate bumper round the edges and a carbon fibre body for great grip. It also boasts a raised bezel to keep your screen protected, as well as tactile button covers so your phone is protected but the great design isn’t compromised. For all of that protection it also looks good thanks to its sleek metallic edges and simple, black body. This is a super simple case from Tech21 that’s designed to really show off the great-looking S8, while also keeping it protected against knocks and scrapes. The case has 1.5m drop protection, meaning it’ll keep your phone safe during most everyday accidents and it’s got a scratch resistant surface too. A lot of cheaper clear cases are prone to yellowing, but this one has enhanced UV yellow resistance. If you like metallic, futuristic-looking designs then this case from Obliq will suit you. It’s got a shiny silver finish that also boasts a comfortable hold that promises to improve grip - not more clumsiness! The whole case is shock resistant, but the corners are specially guarded against knocks and falls with AirSpring Technology designed to absorb most of the impact. Need more juice? This surprisingly slim case from Atree promises to double your talk time with a built-in lithium polymer battery. The dual silicone side and hard-back construction resist shock, and there’s an indicator light to let you know when the power is running low. Charge it up with your official Samsung cable and you’re good to go. There’s no need to sacrifice style for substance with Caseology’s Parallax Series. Their military grade hardware promises to battle gravity whilst still looking sharp. Polycarbonate shields the sides and corners, TPU absorbs shock and the gorgeous rubberised patterning improves grip. Add a bit of bling to your smartphone with one of Swarovski’s brand new Heroism cases. Taking inspiration from their famous crystals, this angular case has transparent sections, crystal fabric and metallic, mirrored triangles. And it’s more than just eye candy. A bumper shields the edges of the handset and the screen and camera sit behind a beveled lip. If you want a more natural look for your Samsung Galaxy S8 then this new collection from Snakehive should be high up on your list of potential candidates. The Wilderness case is constructed from sustainably sourced FSC wood, which comes in a selection of types depending on your preference. Walnut, Bamboo, Cherrywood and more are available, with the wooden backplate partnered with a PU binder and a soft rubberised matte-black holder to hold the handset securely. A small etched Snakehive logo on the rear and a 12-month warranty complete the package. A top case at a top price. A super minimalist new entry from Spigen, the Samsung Galaxy S8 Case Ultra Hybrid is just understated perfection. Indeed, minimalist enthusiasts will find a lot to like here, with the Ultra Hyrbid delivering an incredibly streamlined case with shock-absorbent TPU bumper and thin PC back plate. Despite its waif-like appearance, the Ultra Hybrid comes with Mil-Grade certified Air-Cushion Technology in all corners and a raised lip to protect both screen and camera. Less than a tenner too. The modern-lace design on tech21's Evo Check Lace Edition Case is just lovely, while the three-metre (10ft) drop protection, three-layer FlexShock™ impact absorption system and ultra light weight construction fantastic, premium extras. The price, ringing in at £39.95, is quite steep for a smartphone case, however, tech21's pedigree and the case's quality can not be denied. Available in Smokey/Black and Clear/White colour schemes. An old and very stylish friend returns once more in the form of the Samsung Galaxy S8 Case Neo Hybrid, one of Spigen's most established models. As usual, there is very little not to like about this extremely modern and streamlined case, with a slim, dual-layer structure made from TPU (Thermoplastic Polyurethane) and PC (Polycarbonate), a fingerprint-resistant back panel with herringbone pattern, tactile buttons, precise cutouts and trust-worthy Mil-Grade Protection certification. Oh, and it also comes in a large number of tasteful colourways, including Gun Metal, Burgundy and Coral Blue. The Otterbox Defender Series of cases is famed for its durability and the version created for the Samsung Galaxy S8 is no exception. This case has a multi-layer design to make it drop-resistant with a durable outer slip cover and a super solid inner shell. It comes with small covers to prevent dust and dirt from getting into ports and jacks, as well as a holster, which you can use as a stand or belt-clip. A simple, scratch-resistant case from Incipio with a strong, polycarbonate outer shell and an inner core built to absorb the shock of most knocks and falls. It has a soft touch finish, which makes it nice to grip and less likely to fall out of your hands mid-call. You can choose from a simple, classic palette of shades, including champagne, white and navy blue. 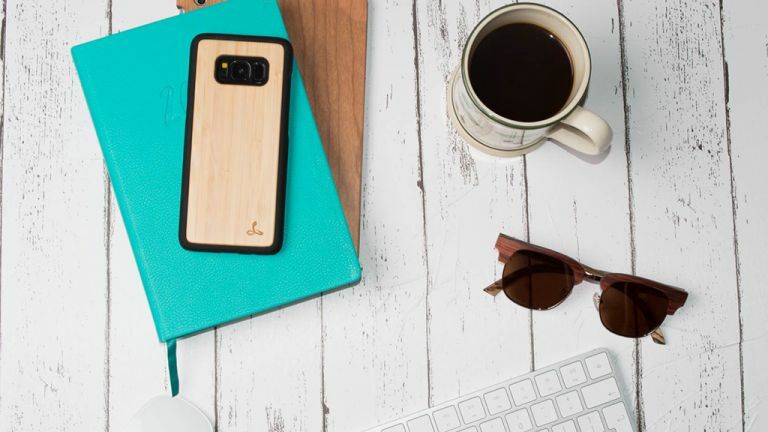 If you like cases that fit tight to your phone so you don’t lose its great design by protecting it, you’re going to like this option from Caseology. Like most cases on this list, it boasts a dual-layered design to better protect against everyday accidents. It also has a 3D pattern on the back, as well as added grooves to the edges, to give you better grip. This official offering from Samsung is guaranteed to fit your phone like a glove. It’s protected several past iterations of the Galaxy handset, but don’t let the lack of novelty put you off. Billed as a ‘smart case’, the NFC-powered wallet draws power wirelessly, giving you access to core functions without having to flip the cover. If you go anywhere near water with your phone, this case is a must-have. The fully sealed enclosure can be submerged to 3 metres (10 feet) for an hour or more and comes with a flotation strap to prevent unwanted sinkage. It’ll resist two-metre drops and repel snow, rain and sand, keeping your handset operational during the roughest of adventures. This is Ted Baker's flagship folio case for spring/summer 2017 and, simply put, it is a doozy. Finished in cool navy and designed so that its texture mimics Ted's suede bomber jackets and nylon outwear, the BOATSEE in most definitely on trend in the style department. In terms of functionality the case is impressive as well, with an embedded back shell providing solid drop protection, and an interior pocket delivering card and cash carrying capabilities. Ergonomic cutouts complete the package. T3 favourite Snakehive brings its super slick and stylish Vintage Two Tone Leather Wallet design to the Samsung Galaxy S8 with unsurprisingly pleasing results. The case is constructed from beautiful Nubuck leather, which is a top grain material, and features a sanded soft suede textured finish that is super soft in the hand. Due to the quality of the leather the Vintage Wallet is also incredibly durable. In terms of features, the case comes with three credit card slots on the inside front panel, a magnetic clasp closing mechanism, and a screen-protecting super soft inner lining. Naturally, all ports and buttons are left accessible. Simply put, one of the best cases on the market. RhinoShield comes charging into this best Samsung Galaxy S8 case roundup with a tasty case of its own, with the CrashGuard Bumper Case for Galaxy S8 delivering a super minimalist piece of protective gear that prioritises mitigating drop damage. The case is constructed from a secret in-house material that absorbs up to 90 per cent of impact energy, and features a hexagonal structure that adds an extra 15 per cent shock dispersion. Amazingly, it can offer this level of drop protection despite measuring in as thin as three stacked credit cards. Naturally for a bumper-style case, both the back and front of the Galaxy S8 is left exposed, however the CrashGuard does feature both a raised lip to protect the phone' screen when placed face down, and sports an exterior soft shell material with matte finish that is easy to grip. This minimalist case is designed to make the most of the S8’s curves. Designed to hug your phone without suffocating it, the soft polycarbonate grips only the top and bottom of the handset. Not the sturdiest case on the market, but it absorbs corner shocks, improves grip, and leaves those bevelled edges out to be admired. American design house Kate Spade is known for graphic prints in black, cream, gold and rose gold colour-ways. Opt for subtle texture, make a statement with oversized florals, or go all out sparkle with floating glitter. Subtle bevelling protects the screen and camera, and the slimline design doesn’t add unnecessary bulk. If you like having space for credit cards next to your phone but sometimes want a sleeker feel, then this case is for you. It has a card storage section, but it’s detachable. This means you can leave it at home if you’re carrying your wallet or easily add it again for ultimate portability. It’s comprised of three different layers to keep your smartphone wrapped up safe and has 3m drop protection, meaning it’ll be safe and sound when it comes up against most everyday knocks and scrapes. This case from Speck is designed to withstand drops as it has enhanced impact protection built to absorb and disperse shock. But the built-in protection doesn’t compromise on style as it still provides a snug, slim fit against your new smartphone. The simple geometric design on the back of the case looks stylishly minimal and also adds extra grip. Boasting a sleek silhouette and constructed from premium full-grain leather, this classy case from Mujjo is just super. Clean and contemporary, with a phone-hugging design, the Mujjo Leather Case for Samsung Galaxy S8 offers classic back, side and corner protection, as well as delivering a raised edge profile that keeps the phone's gorgeous screen clear of any surface when placed face down. All buttons and ports are easily accessible, the case comes in two solid colour schemes (black and T3's pick, saddle tan), and offering a refreshing lack of busyness, it's hard not to warm to this tasteful piece of protection. We kick things off with a really classy case from Speck. The Presidio Clear + Print not only offers drop-dead gorgeous aesthetics, with an ultra-slim design partnered with stylish graphics, but also a solid build as well, with a dual-layer design featuring Impactium, a material that has been designed to absorb and disperse shock away from impact points. 8 feet drop protection is delivered too, while the materials used resist UV yellowing. With a grooved transparent polycarbonate back, scratch-resistant UV coating and D3O® material frame, the Greenwich manages to combine minimalist style with advanced protection. The D3O® material is the real sell here, with its molecules locking together to absorb and disperse energy upon impacts. Four solid colour schemes are available as well, with Orchid Grey, Gold, Silver and Black in the range. Something genuinely different here that is bound to appeal to minimalists. The ShieldView Glass by Speck is simply a tempered glass screen protector for Samsung Galaxy S8 (and S8+). The glass is perfectly crafted to fit the new smartphone with a design that matches the curved screen from edge to edge, while a glossy finish means that - unlike with standard glass - you don't get loads of messy fingerprint smudges. Obviously, you do not get all round protection with the ShieldView Glass, however if you are just concerned with protecting the S8's gorgeous screen and want to maintain its sleek lines, you can't go wrong here. Can be combined with other Speck cases too. Next up is a case from Peli, who has dropped a brace of new Samsung Galaxy S8 cases, the pick of which is the Peli Vault. Offering a lifetime guarantee, the Peli Vault offers a streamlined, folio-style case crafted from tough polymer plastics and TPR rubbers. It also features an interior card slot for ID, credit cards or notes, and also incorporates a kickstand for hands-free media viewing. Interestingly, the case also features a partial viewing window in the front cover, allowing you to see who's calling even when the case is closed. Maybe the only downside is that it only comes in one black/grey colour scheme. Tech21 offer some super serious drop protection with its Evo Go Case for Samsung Galaxy S8, with the phone protector offering protection from drops of up to 3m/10ft courtesy of an all new, "FlexShock", 3-layer impact absorption system. As such, you can be quite confident that any drop from human height, even if you are holding the S8 above your head, will be dealt with by the Evo Go. In addition, the Evo Go offers a concealed card compartment (alliteration FTW!) with magnetic closure, and comes in two colour schemes, Orchid and Black . The only downside is the cost, which rings in a five pennies shy of sixty nicker. X-Doria halo drop into T3's best Samsung Galaxy S8 cases roundup with the tough-looking Defense Lux, which "combines refined luxury and durability to create the ultimate protective case." A rugged one-piece, snap-on construction, engineered with a soft inner rubber layer, impact resistant polycarbonate backing, and machined aluminium outer frame would suggest this is not hyperbole either, with the Lux genuinely offering a top-tier build. The fact that the back panel comes in various schemes, including Black Carbon Fibre and Rosewood (as pictured), is just a sweet added extra. If you like wood as a material and want something unique to you then you'll no doubt like Carved's range of Samsung Galaxy S8 and S8 Plus cases, which come in three different varieties. The GS8 Plus Satellite range are made from live-edge blocks, allowing customers to get the exact swatch they want, while the GS8 Turtle (pictured above) is made from two different wood species and two different types of sea shell, and the GS8 Teton is made from ebony, walnut and maple. Lovely, hand made cases that are literally one of a kind. Next up in this best Samsung Galaxy S8 case roundup is the 'Crystal Mixx' by VRS Design, which offers a budget-friendly option for those looking to protect their Samsung Galaxy S8. The case is a transparent bumper affair with raised edges - perfect for keeping that gorgeous screen elevated off a surface when placed face down - and a shatterproof polycarbonate build. Tight port cutouts, TPU button covers and a price that rings in cheaper than pint in some parts of London complete the package. If you want something a little flashier to show off your Samsung Galaxy S8 then the Scottii Luxurii Gem could be right down your street. Despite rocking a solid dual-layer polycarbonate and TPU build, the Luxurii Gem features a glamorous glitter, non-slip design, as well as a bundled tempered glass screen protector. Throw in excellent button and port access, as well as multiple colour schemes including silver and gold to choose from, and you've got an attractive Samsung Galaxy S8 case at an even more attractive price point. Scotti squeeze another case in to this best Samsung Galaxy S8 case roundup with its Tactical Titan, which is obviously gunning for Olixar's impressive and long-running ArmourDillo range of cases. The Tactical Titan delivers a similar heavy duty aesthetic and build, with a dual-layer construction partnered with impact cushions and a tempered glass screen protector. You also get a slip-resistant pattern on the case's rugged exterior, as well as the mandatory excellent port and button access. Otterbox are renowned for their rugged Defender smartphone cases, offering 3-layered protection in the harshest of environments, but their shields come in classier packaging too. The Symmetry range of sleek cases have a flexible, single-layered design, promising Drop+ protection and shock absorption without the rough and ready aesthetics. Oblik introduces an old fashioned aesthetic to this Samsung Galaxy S8 cases roundup with its stylish K3 Wallet. The K3 Wallet sports an Italian leather, flip cover design (which covers the back and front of the phone), a two-tone pattern for a super stylish aesthetic and, neatly, a rear-mounted card slot for stashing a credit card or RFID travel pass. Precision calibrated cutouts ensure that all ports and buttons are accessible too, while - somehow - the price rings in at under £10. So far the cases we've featured have been quite heavy duty in terms of protection, however, for those looking for something more minimalist then you should check out the Obliq Skyline Advance for Samsung Galaxy S8. This case, despite packing fortified TPU corners with AirSpring Technology, the latter helping to absorb shocks during drops, boasts a slim profile and minimalist, soft touch, matte finish. There's no fancy features like a kick stand or card slot, however, the Skyline Advance is well built, light and city-slicker stylish. Dux Ducis delivers a hell of a case for the price with the Skin Pro for Samsung Galaxy S8. Despite the case only being built with synthetic leather, the Skin Pro offers a stylish flip cover design and handsome feature set, with a magnetic closing mechanism, TPU carrier, credit card holder and built in kickstand. You can also choose from four different colour schemes including deep blue, golden, gray and rose golden. Lifetime warranty thrown in as well for just £5.49? Yes, yes it is. Olixar crash into T3's best Samsung Galaxy S8 cases roundup with this slimline and sleek case that offers a genuine soft grain leather build with tight stitched finish. Indeed, the Executive Wallet Case, while sporting a minimalist aesthetic, is incredibly ergonomic thanks to its low weight and thin profile, and also manages to cram in a magnetic smart stand function, as well as slots for cards, cash and documents. An executive wallet for executives and, you know, people who like nice smartphone cases. We mentioned Olixar's ArmourDillo range of smartphone cases earlier on in this roundup and, naturally, we've included its Samsung Galaxy S8 variety here too due to its excellent damage preventing capabilities. One of the toughest cases on the market, this ArmourDillo offers a two-layer, impact-resistant polycarbonate exoskeleton, textured grip finish portable flip-out stand for media consumption and raised cutouts for screen and cameras. With a price point of not far over a tenner too, this case is both super tough and super affordable. Old favourite UAG are back with the Samsung Galaxy S8, offering a heavy duty and premium smartphone case in the form of the Pathfinder, a piece of protection that has few equals right now. That's because the Pathfinder case boasts a super robust composite design that, aside from packing an impact resistant core, hard exoskeleton and anti-slip rubberised pads, also comes rocking a military-grade MIL STD 810G 516.6 drop certification. That accreditation means that the case is more than ready to deal with any potential drop that comes about from everyday use. It is quite dear in terms of price, however, asides from that its pretty much perfect if you're into the aesthetic. And, rounding off T3's best Samsung Galaxy S8 case roundup is the expensive yet unique Ghostek Atomic 3. It's rather unique as this case features an aluminium alloy bumper (premium! ), waterproof-capable protection up to one metre for up to 30 minutes (woof! ), and a heavy duty scratch-resistant touch sensitive screen guard that is Touch ID compatible (yowzers!). The Atomic 3 also comes with a Ghostek lifetime warranty. The only downside is that the only colour option is red. Wallet cases can add unwanted bulk, but premium case designer, Spigen have a solution. Their Slim Armour CS boasts a TPU cover and polycarbonate back, providing all the drop-protection you’d expect from a hard-case, but with an added extra. Flip the phone over and you’ll find a discrete credit card slot. Simply push the quick tab and slide. British design meets soft Italian leather in this wallet case by Torro. This flip cover has space for a credit card and it doubles as a stand for movie watching on the go. The design is deceptively simple, but the standout feature is the missing clasp. Torro’s case shuts with magnets, eliminating the cumbersome clips that seal most other genuine leather cases. If you’ve fallen for the design of your S8 and don’t want to cover it in a bulky case, then the Barely There option from Case-Mate is for you. It’s completely clear, so you can see the S8 underneath, as well as being really slim, so it doesn’t feel like the design is being compromised. It also has a lay-flat bezel around the screen, which means a minor drop will stop it from smashing.